A cosy space for continental food, with a casual atmosphere, this little café is great to hit up if you’re in BTM. Décor that channels old comic book diners, and a quiz-format menu. A cosy space, with plenty of character, Melt has got us reminiscing about old school diners and Archie comics books. Remember Pop Tates? Yup, this one’s similar! Choose between table or sofa setting, and settle in for a quick coffee or a snack. Movie memorabilia, from black and white pictures to vintage colour filters, is hung across the walls, adding a fun vibe. Perhaps the most fun multiple choice quiz you will ever take, the menu replicates an exam paper — where you can tick what you would like. From creamy cucumber salads to classic sweetcorn soups and chicken nachos, thankfully, there’s no wrong answers! 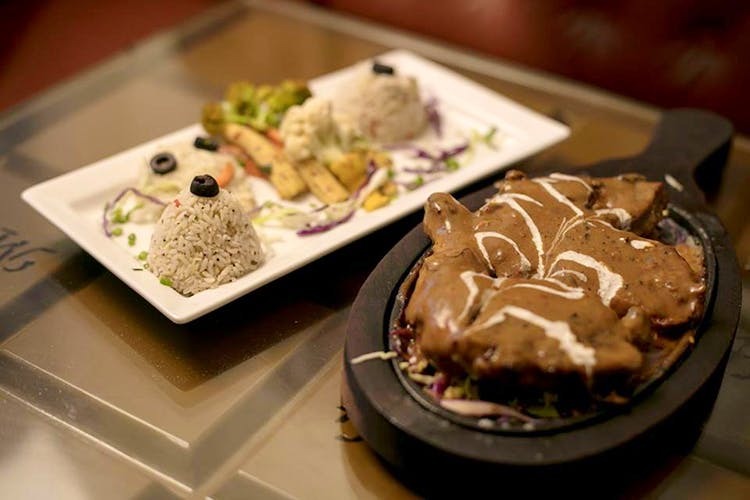 If you have an appetite for something hearty, choose from the steaks, pastas or sizzlers. We tried the Italian pasta with prawns and sundried tomatoes. It arrived with creamy apple and cheese sauce – a hearty meal. The mushroom and corn steak comes with a crispy potato patty served on herbed rice and is ideal for those who’re hungry. Make sure you wash it down with cranberry juice in a mason jar. It needs no Instagram filter and looks super cute. It’s also very refreshing. A decently priced menu, the food is presented more as a fusion of Indian and Mexican – either way we’re going back.